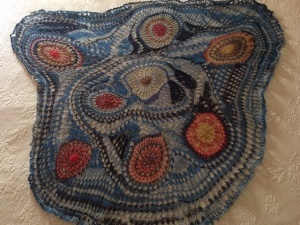 After finishing the “starry night” shawl, I decided to explore the techniques used in it a bit more, but incorporating more colorful yarn for the circles, inspired by aerial fireworks of Independence Day celebrations. 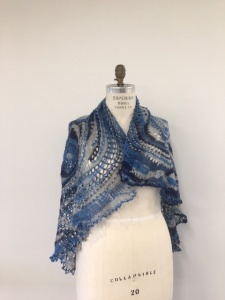 And in addition, it gave me a way to use up some left over yarn from other shawls. 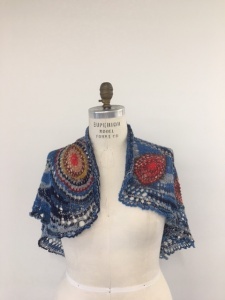 The background/main color yarn used for this shawl was the Paton sock yarn “Singing the Blues” used for the starry night shawl. 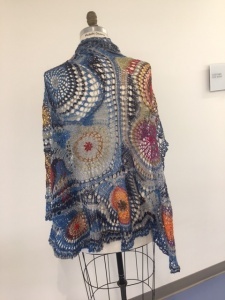 The eight circles were worked up using colorful yarn left from other shawls, specifically the triangular and square shawls discussed earlier. I selected the color to start each circle according to what I wanted to emphasize and discarded some yarn if the color was not what I wanted. Also in this piece, I first tried joining two circles by using the “three needle bind off” method. Here is a snap of that method of connecting a new circle. 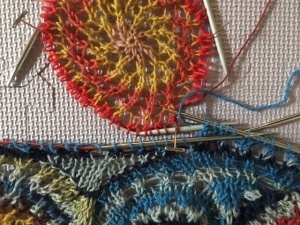 Basically, the two needles, one from each circle, are held together, pointing in the same direction, and a third needle used to knit together one stitch from each needle. 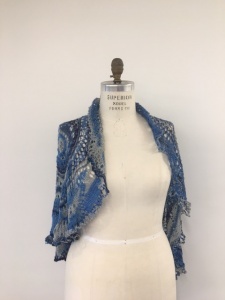 The first stitch is then held on the third needle, the next two stitches knit together, and the first stitch slipped over the second as if binding off. When using the bind off connection, you can use both the yarn from the main piece and the yarn from the added circle to do the bind off, or you can use one or the other as a single strand, and use the other yarn later when you knit around and incorporate it as you like. Sometimes this decision is influenced by the colors of the respective yarns, if different. 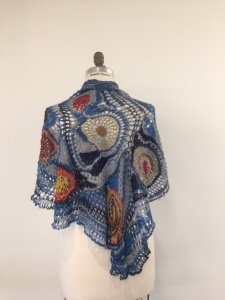 This shawl was worked similarly to the first fireworks piece, but in many of the circles, the yarn was switched/changed to make the individual circles more colorful and also to have the same colors appearing in several circles. Again, I found it very helpful to periodically pin the piece out on blocking mats to evaluate shape and color balance and decide where to add additional circles. In this photo, you can see there are already seven circles of very different size, and also that I have used the bind off join method more. Exploring where to add which circle next. 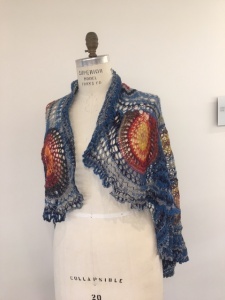 I will start several circles and decide on placement based on which look best as well as where the shawl needs to grow next to have desired shape. Here two circles have been added but added together. The two were first joined and then expanded, as I wanted one to “overlap” the other. Once large enough and with a somewhat flat side, the two were connected to the main work with a bind off. 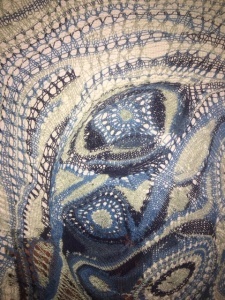 This shows a circle being joined to the main work with short rows. 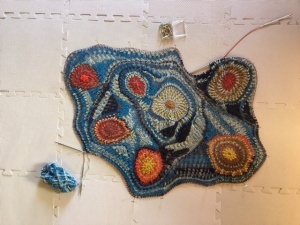 The short rows have been worked in the lower part of the picture, below the joining point, and I am about to work back around the smaller circle to work short rows in the space above the joining point. Here is yet another variation, worked in one multi-colored sock yarn, using multiple circles. 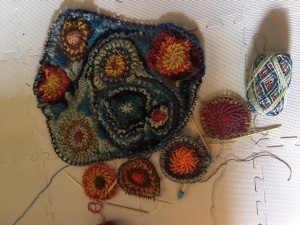 Next projects include more works using multiple circles and free form designs using short rows. Stay tuned. 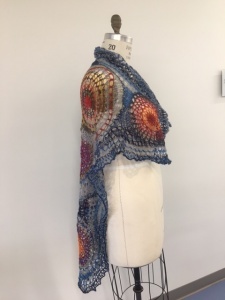 After I had done a couple of circular shawls, I was interested to see how the basic circles could be modified into other shapes, as discussed earlier, but I also thought to combine the circles together using short rows. 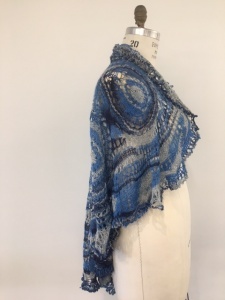 The inspiration for the first project was the pattern of concentric circles in gray and blue produced using the Paton sock yarn in the “Singing the Blues” color. This yarn has shades of blue ranging from a dark navy, to an intense cobalt blue, to lighter blue and gray. 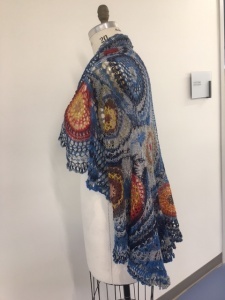 These reminded me of the colors used in some of van Gogh’s paintings, and I decided to try to make a shawl with many circular and spiral “stars” with a background of clouds and night time sky. 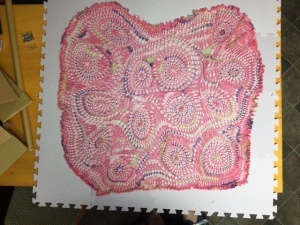 I began with a basic circle worked out to about 8 to 10 inches in diameter, then made a similar but smaller circle. 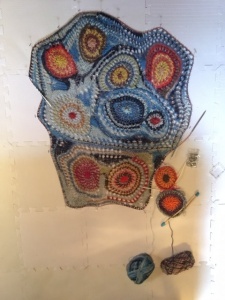 I hooked the two together by working short rows in the space between where the circles touched. Basically, I knit around one circle’s edge, then simply knit around the second smaller circle edge back to where the next stitches of the first circle could be knit. At this second join, I knit 3 or 4 stitches, turned (wrap and turn) and purled back about 6 to 8 stitches, turned, and knit back. 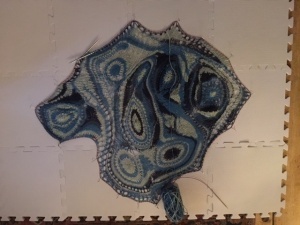 On this knit row, I decreased two stitches by knitting two together along the rim of each circle, then knit to one stitch past the first turn, turned and purled back. I worked short rows for about 1 to 2 inches in this fashion, decreasing 2 stitches in each knit row about 4 to 6 times, then decreasing only one stitch in the knit rows, judging by eye when the curves of the two circles looked best. Once out several inches, I purled back around the smaller circle to the joining point and repeated the process. If the yarn in the initial knit stitches at the first join has stretched or pulled out to make an oversize loop, I frequently make up a stitch or two by knitting or purling down a row to tighten up the join. There is not an exact way to make this sort of join and you should expect to improvise as needed to keep the circles somewhat circular and the short rows lying flat. Also, as I work the short rows, I will begin to add some yarn-over-knit-two-together “holes” in the area of the joining to break up the otherwise solid patch of stockinette stitch and also the increase the flexibility and stretchiness of this area, which will greatly facilitate blocking. This is the work in process. 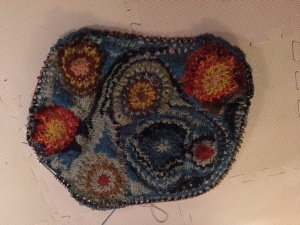 I found it very helpful to periodically pin it out on the blocking mats to monitor how the shape was coming and decide where to add the next circle(s). 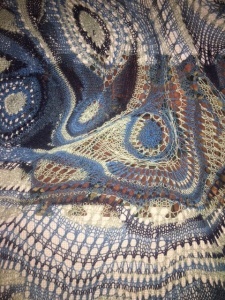 This is the completed shawl on the blocking mats. The two circles more or less in the center were the first to be constructed and hooked together. Then some short rows filled in around them before more circles were added to the growing edge of the piece. There are six circles in this part. 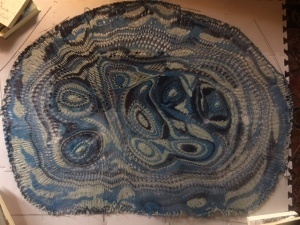 Then the two larger circles were worked up and connected to the edge of the piece. 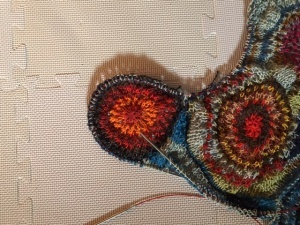 Once all the circles were attached and the spaces between filled with short rows, the perimeter was knit around for a couple of inches, letting the color changes of the yarn make the pattern. Then, the final several inches was worked around using short rows to make larger patches of the colors of the yarn. 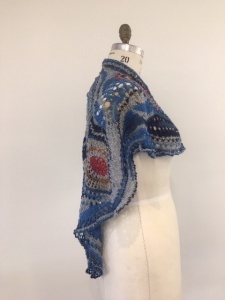 To do this, I just work along on a row and when the yarn color changes, I work a bit farther, then turn and work back to or just before or after the color change, then turn again. By working back and forth in this fashion, you can make interesting blocks of color of varying shape. 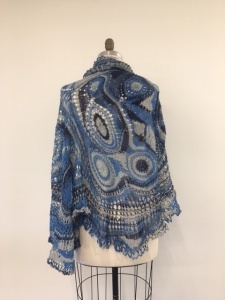 As with most of the shawls, this piece was finished with a final doubling of the number of stitches (yarn over-knit one), a knit row, and binding off. 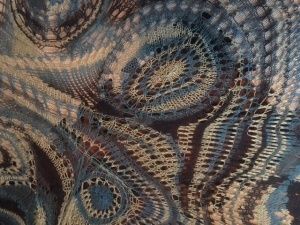 These are some detail snaps of the piece showing the short rows worked around and between the circles of various size.